Just recently, a neighbor did something that I could hardly imagine. It involved the trapping of 2 of my cats. Fortunately, after a week’s absence, we recovered one. Another cat is still at large. I am circulating a poster throughout the tri-villages, in hopes of finding him. You should note he’s a polydactyl, meaning he has 6 toes on his front paws. If you know anyone in the area, please forward this to them. 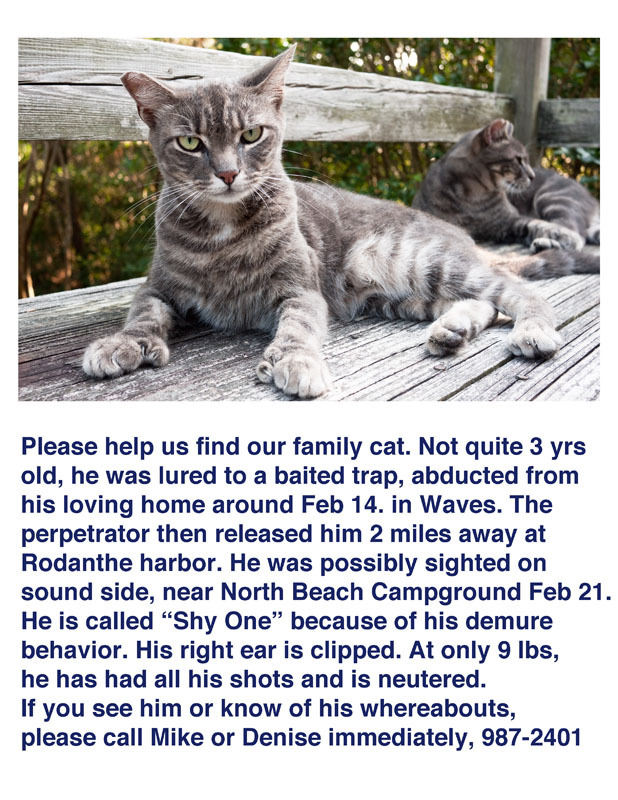 This entry was posted in Animals, Outer Banks on February 26, 2013 by j0jgvm89bj. This almost looks like the remains of a relic village from a past civilization. 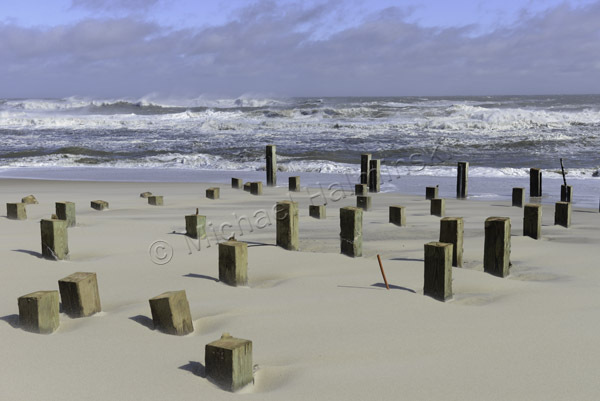 The sands of Cape Hatteras hide many old secrets, like the Lost Colony, shipwrecks and ancient forests. In reality, this is the severed foundation of the first house built on the oceanfront at Mirlo Beach. As I recall, it was constructed around 1985 and was named East Wind Station. There was a healthy dune in place, and life was good. It was renamed Toes in the Sand when it was sold recently to a new owner. 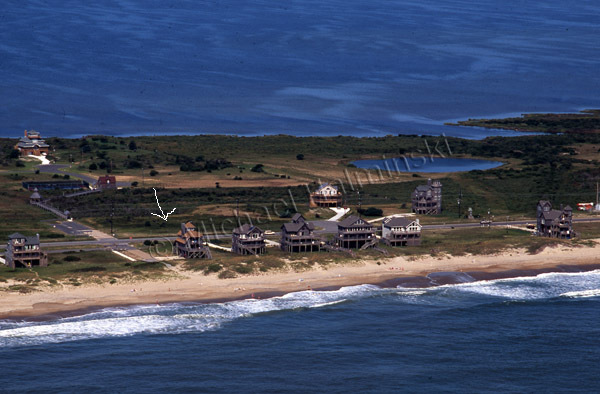 My 1991 aerial photograph shows East Wind Station sitting behind a lush dune. It’s the house with the brown roof, just left of center. Today, life is not so good at Mirlo Beach. Property continues to wash away, and Toes in the Sand is being prepared to be pulled to a location that is a little more secure. It’s fate rests on steel I-beams with wheels, on the side of highway 12 . In the meantime, stormy seas sweep over the beach with regularity. The road is often impassable at times of high water. 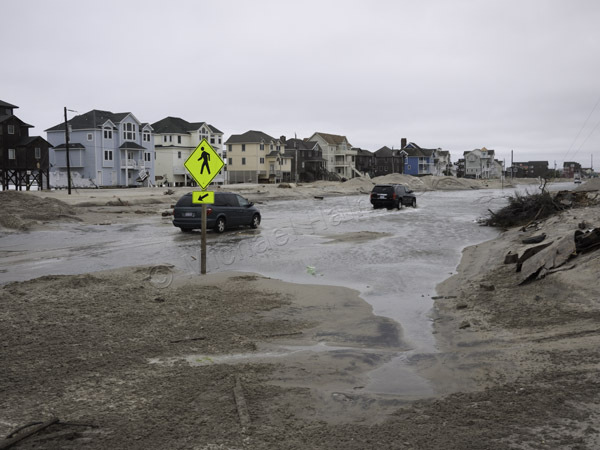 So when you drive down, it’s best to come at low tide. 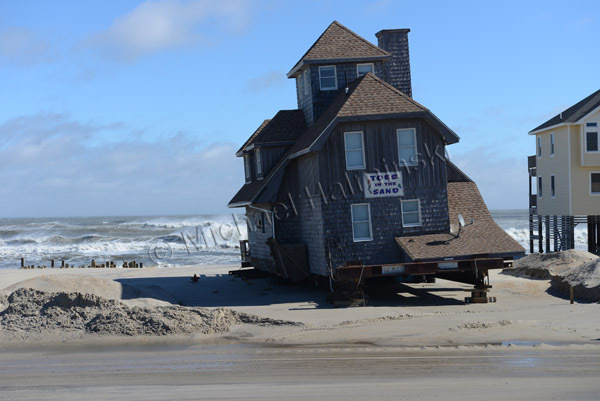 This entry was posted in aerial photography, buildings, Outer Banks, Sea, storms on February 11, 2013 by j0jgvm89bj.